The country's first renewable energy auction will go ahead on 26 February after Colombia's energy planning authority rescheduled plans to carry out the tender this month. Developers will compete for 12-year power purchase agreements (PPAs) for 1,183GWh/year — equivalent to approximately 300MW and just under a third of the capacity initially sought. The country’s mining and energy planning unit (UPME) had initially intended to award ten-year contracts through a tender for clean energy projects capable of producing 3,443GWh/year to be held on 2 January. Following a consultation with potential participants in November, the new government deferred the auction until February. Contracts will run from 1 December 2021, with UPME planning for these agreements to be signed by the end of March 2018, according to government documents. The auction is part of the new government’s plans to source 1.5GW of renewable energy by 2022, Diego Mesa, vice minister of energy said. It is open to already operating renewable energy projects. The ministry of mines and energy (MME) stated only projects coming online after 31 December 2017, would be considered. It had previously announced a total of 54 hydropower, biomass, wind and solar PV projects with a combined capacity of 3GW are currently registered with UPME and were eligible to compete in the tender. Colombia’s first clean energy auction would "diversify, complement and boost the competitiveness of the energy matrix, making it more resilient to climate variability, contribute to the reduction of carbon dioxide emission and guarantee the country’s energy security", the MME added. 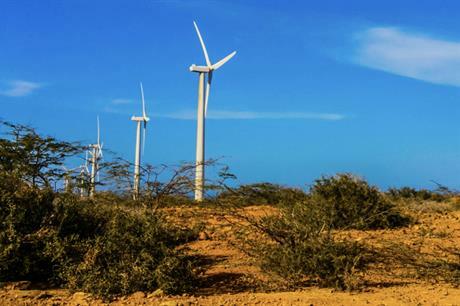 Colombia’s only operational wind farm is the 19.5MW Jepírachi site owned by public utility Empresas Públicas de Medellín in La Guajiria on the country’s northern Caribbean coast. The Global Wind Energy Council (GWEC) believes up to 500MW wind power capacity could be added in Colombia annually, and by 2028 wind could provide about 20% of the country’s power.